I have a week old pair of pigeons who seem to be starving. There been a pigeon nest on my verandah with eggs. I noticed the babies must have been born on 16/11/11. On sunday 20/11/11 it started raining.... heaps.....The nest was in the corner of my uncovered balconcy in about 1/2 cm of water and the wind was very strong. The mother was shivering really bad and i could see the babies trying to get under her but she wasn't letting them. I may have done the wrong thing but i brought the babies inside as i couldn't bear to see them trying to get warmth. The babies were very cold and the big one was stuffed full of seeds with a very hard crop. I went and got some Parrot rearing mix from the pet shop and made it very runny like milk. I gave them some untill the crop felt suidgy. I mainly gave the big one water. The crops seem to stay full for a very long time. This morning there was only a little bit in the crop so i fed them at 7:30 (till the crop felt squidgy) i came home at lunch and it wasn't as full as the morning but defenetly no empty, i game them a a drink of water & tiny bit of food because they are acting ravenous. I checked them at 4:30 pm and they still look full, and still at 6:30 pm. although the small one seems to digest slightly more. I have had to separate them because they go beserk, mouthing each other and very rough. they act desperate for food when i touch them, especially the big one. I have not fed them beteween the hours of 11:30pm and 6:30 am during any nights and the crop does empty a fair bit during night. I have been cleaning the utensils and keeping in baby bottle strealising solution and rinsing between uses. Oh on tuesday also at the first feeding the small one was twisting its next back and around and under its wing really weird but at the next feed it was find. The big one is twice the size as the small one and starting the get feather spikes out from the skin. Are the bird starving? Whats with the crop? They can both support their own weight when attacking me for food still. IAm going to the shop to get apple puree for their night feed and i will but apple cider vinegar in the water. I read you can sqeeze the food out but i think im too inexperienced to attempt that. I have no idea what to do, but it defenetly feels like something is going wrong. It's really important to keep baby pigeons warm with a consistent form of heat because they are unable to keep them self warm until they are feathered. Consistent means a heating pad set on low, or a light over the baby. If the baby isn't warm enough, the baby can't process the food and it says in the crop and can sour. If the food sours in the crop, bacteria can start to grow which can be fatal. The same is true if new food is added to food already in the crop. It can cause a bacterial infection and so the babies should only be fed when the crop is empty. That's how they act when they are hungry. Please put them back together as they give each other warmth and comfort. I'm unclear as to how much you are feeding...I measure in cc's or ml's...but again, if the babies aren't warm enough, the crop won't empty. The formula should be thicked a bit as the babies grow.I wonder if you are over feeding? My guess is that the little baby has some kind of an infection...maybe canker. The bigger one likely has it too but is coping with it better, probably because he is stronger. It probably would be a good idea to have them checked by a vet that knows pigeons. Applesauce can change the ph balance in the crop. You don't need the vinegar too. I think the baby needs more than applesauce at this point though. Actually...what a vet will do is flush the crop and it should only be done by someone that knows how to do it and it can save a life. My thoughts on reading about the babies were the same as Matilda's. You are to be praised on your efforts to help these two babies, but I feel that the wet and cold they were exposed to may have taken a heavy toll. The babies need a lot of food at the moment, little and often, and if their crops aren't emptying and they can't get the nourishment they need, they will quickly weaken to dangerous levels. Judging by their behaviour, they are obviously VERY hungry. If it was me, I would take them straight to a vet experienced in pigeons, as the crops may need to be flushed and they may need an antibiotic injection (oral administration on such young babies is likely to be ineffective). They probably have canker as well, and the meds for that don't come in injectable form; I've never had such young patients with canker, and here again a vet's opinion is needed. The warmed apple sauce is a great idea, especially if you gently massage their crops after eating. As for the ambient temperature, it's a tremendous improvement on outside temperatures, but they need contact heat (as they had with their parents) at about 38-39ºC, so a heating pad on low, wrapped in a towel, would be the best option. And, if that doesn't pose a danger to the smaller baby, keeping them together should comfort them. Replacing the water they're having with a hydrating solution such as Pedialite would also help, unless there is a yeast infection which would make it unadvisable to give them anything containing sugar. I'll be working very long hours again tomorrow, but I'll try to check in during breaks. Thank you so much for all the work and research you're doing on behalf of these little ones. Sending you best wishes for their recovery! Im not even sure what "empty is". Thjey poos are like brown sludgy now. kind of look like the formula. I live in canberra, i will try to take to vet. RSPCA turned me away. Unfortunately the RSPCA and many other associations don't care about pigeons. 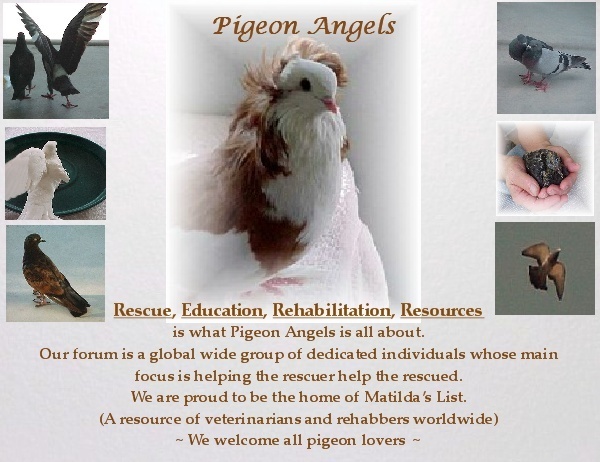 It's hard to find help for them in Australia, because your laws regarding feral (street) pigeons are quite harsh, so YOU MAY HAVE TO SAY THEY ARE YOUR PETS to be sure they get care, but unfortunately that can be expensive. I'll see if I can find someone in your area. I've read that in some areas of Oz there is a PMV outbreak. All movement, shows, racing etc have been stopped so be careful what you do. Another pigeon lover said that the PMV1 outbreak was in the State of Victoria, and that in Canberra there were no problems. But nobody so far has been able to suggest a vet or rehabber in your area. Keeping you and the babies in my thoughts and prayers. Just got this advice from an Australian member. I hope it works for you. For me, using vets to diagnose or treat feral pigeons in Australia is such a tightrope. I guess what I would do personally if I had two ill young pigeons would be to make a few calls to the local wildlife rescue organisations, asking for someone who rehabs native pigeons. I would say that I have two native , grain eating pigeon babies like crested pigeons, or common bronze wing pigeons (they are both found in Canberra) for example. That way I might get access to advice over the phone, if not actual physical help.